The dates kick off August 6, 2019 in Florida. Kiss have announced the second leg of their farewell End of the Road tour. The new dates kick off August 6, 2019 in Sunrise, Florida, and wrap September 16 in Oakland. Kiss Meet & Greet Experiences for the new dates will be available Tuesday, November 27 at 10 A.M. local time through kissonline.com. Kiss Army fan club presales will begin Wednesday, November 28 at 9 A.M. local time. Tickets to the general public will go on sale starting Monday, December 3 at 10 A.M. local time. 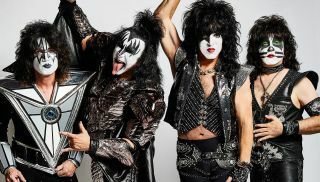 Kiss initially announced the End of the Road tour during an appearance on NBC’s America’s Got Talent in September. "This is gonna be our last tour," singer and guitarist Paul Stanley said following their performance of “Detroit Rock City" on the show. "It will be the most explosive, biggest show we've ever done. People who love us, come see us. If you've never seen us, this is the time. This will be the show." You can check out the new dates below. For more information, visit www.kissonline.com.